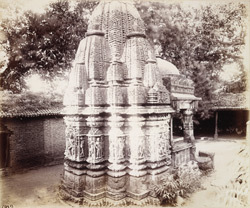 Photograph of the Someshvara Temple at Ghurad in Gujarat, taken by Henry Cousens in the 1880s. In the 'Archaeological Survey of Western India, vol. IX' of 1903, Burgess and Cousens wrote, "Here is a small old sculptured temple in a walled enclosure, dedicated to Somesvara Mahadeva. Part of the basement is now buried below the present ground level; the porch appears to have been rebuilt, and is now bonded with the masonry of the shrine...It faces west...The principal figures on the outer walls of the shrine are Mahakala on the north, Natesa on the east, and Bhairava on the south, whilst over the shrine door is Ganesa. These figures are well carved and remind one somewhat of the Elura cave images. The jambs and lintel of the doorway are much encrusted with layers of whitewash. In the porch is a neat flat ceiling...The sikhara or spire is entire, though it has been mended and possibly rebuilt. the roof of the porch is evidently quite modern."